Punching bags for kids has always been quite popular among kids, given that your children are probably hyper active and you don’t have much time to play with them. By getting a punching bag, they will have some fun walloping them and having fun at the same time. 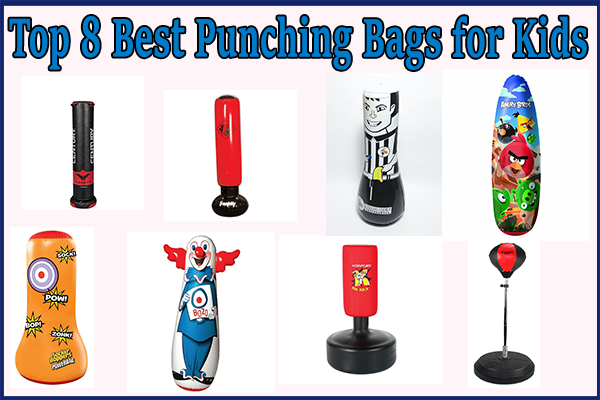 We have compiled a list of suitable punching bags for them. Some are more “serious” boxing bags while others are just playful punching bags. If you want to give your kids a great toy for play and exercise, the Big Time Toys Socker Bopper Power Bag has no rival. This kid’s punching bag is a fantastic choice because it has the world’s fastest bounce back yet it is soft enough to keep the kid punching as fast as they can. Knowing how energetic kids are you would expect the bag to pop after a few weeks of use. Made form the finest materials, the Big Time Bopper can withstand tough and rough conditions meaning you do not have to put it away when other older kids come visiting. The bag is air-inflated to ensure your children have a lot of fun while being safe. 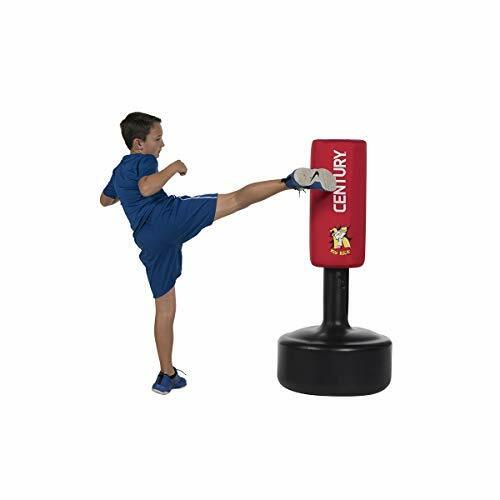 Velocity Boxing Children's Pro Freestanding Reflex Punching Bag w/ Pair of Gloves, Hand Pump, Adjustable Height 47 - 57"
When you want give your kids a fun experience like no other, the Velocity Boxing Children’s Pro Freestanding Reflex Punching Bag is your ideal choice. With an adjustable height, the punching bag is great for kids of all ages. The fact that the package comes with a pair of gloves means that the kids can enjoy a safe, fun and realistic experience. When you purchase other types of kid’s punching bags, you have to struggle to find the right place to mount them. Velocity Boxing Children’s bag is one of the best kid punching bags for boxing since you are free to place it anywhere you desire courtesy of its freestanding feature. As a bonus, the package comes with a hand pump for inflating the bag. Bozo the clown has always been a favorite character for kids for decades. First launched in 1946 as part of a children’s book ”Bozo at the circus” the character has always fascinated kids. 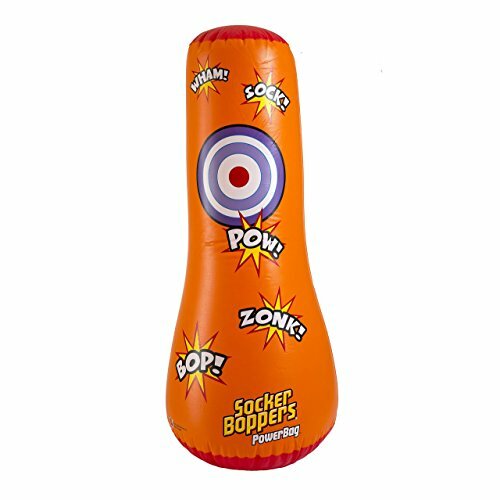 The Original 46″ Bozo 3-D Bop Bag carries on the fun tradition to this day. 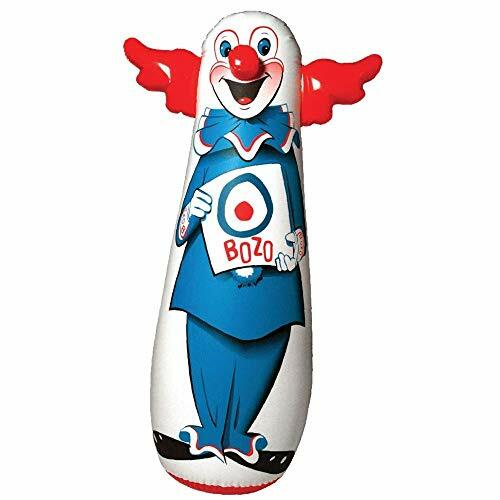 Bozo the Bop Bag now stands at 46” making it a fun full-size punching bag for kids. The bag’s large size means that it is ideal for all kids above 3 years. Your kids will love the Bozo Bop bag since when the weather is fine, you can place it outside for maximum fun. 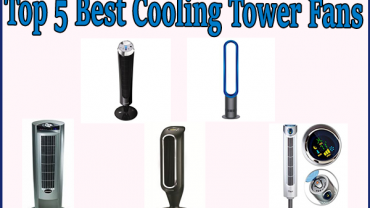 Should the weather be cold, the kids can still have fun playing with it indoors. The bag is so easy to inflate that you can even inflate it using your mouth. Although there are many kids boxing bags out there that claim to offer kids a fun experience, none can match the Franklin Sports Future Champs Mega Bag. Made for kids that are looking for fun and fitness at the same time, the bag has the potential to mold the next generation of champions. The mega size is ideal for all kids above 5 years and an amazing feature of the bag is dad can also have a go at it when he is stressed. The high-quality material used to make the bag ensures that the water at the base does not leak. When deflated, the bag is compact meaning you can carry it along to the park to spice up your day out. It is a well known fact that kids that learn to appreciate sports from an early age grow to become sporty adults. The Kid Kick Wavemaster is the perfect toy if you want to introduce your child to martial arts from an early age. This free-standing bag has a low and heavy base which means that even the most active kids can have their maximum fun without toppling it over. Unlike other bags that can only be used for boxing only, the Kid Kick can be used to nurture your kid’s skills in karate, kickboxing and other mixed martial arts disciplines. The bag has four weight adjustments making it ideal for kids of all ages. Regardless of how active your kids are, the tough nylon material on the exterior is durable and wear-free. 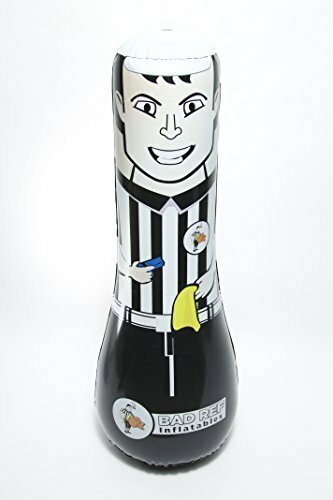 Referee Inflatable Punching Bag - Stress Reliever for the Die-hard Sports Fan and Fantasy Football Players by Bad Ref Inflatables - Durable Material for Kids and Adults - A Great Gift! If you want to have a great relationship with your kids, you need to find fun activities that you can participate in together. The Referee Inflatable Punching Bag is one of the best kid punching bags for boxing. This easy to set up bag features a referee throwing a penalty flag or calling for a touchdown. Not only can you enjoy playing with this bag with your kids but also with your football friends. If your favorite team is losing a game and you think the referee is to blame, you will have so much fun punching the bag. When you are setting it up, you can either use water or sand at the base for guaranteed stability. Most bags come in a material that cannot be repaired in case it gets torn. 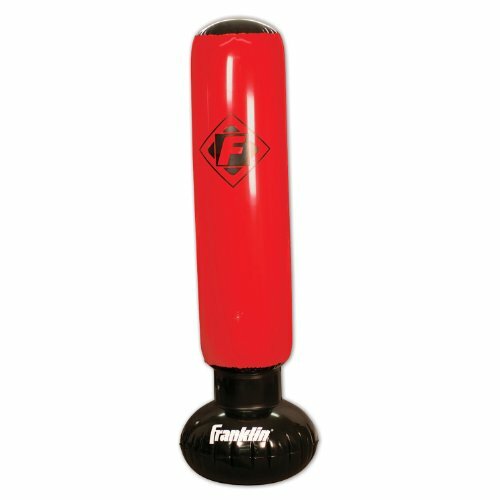 The Referee Inflatable Punching Bag is made of a durable material and in the unlikely event that its gets torn, you can use the hope repair kit in the package to give it a new lease of life. If you are looking for colorful fun for your kids, the Bestway Toys Domestic Angry Birds Punching Bag is your best choice. 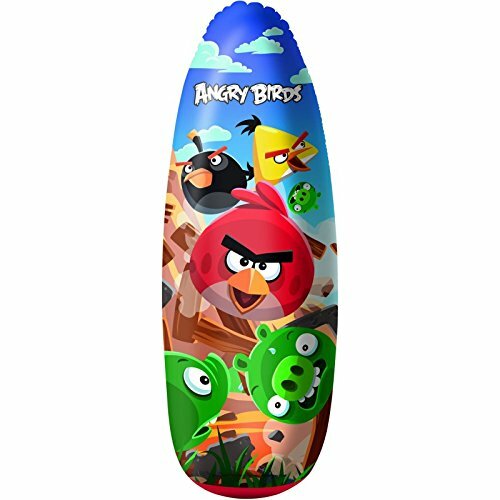 Made from a high-grade PVC material, the bag features fancy designs with pictures of angry birds for your kids to punch. The unit has an inflation nozzle for ease of use and the large size makes it ideal for kids of all ages. The Bestway Toys punching bag has a wonderful shape that allows it to stay upright even when used by extremely energetic kids. If you are looking for the best deal for your money, this bag is your best option because it fairly priced in comparison with similar units in the market. Raising a young champion requires some hard work. You have to teach them to love sports from an early age. 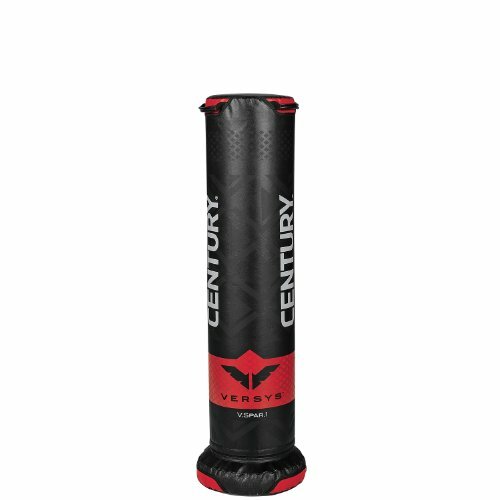 The Century Youth V.SPAR.1 Versys Punching Bag will help you achieve your goals faster because it is made with future champions in mind. The height of the bag makes is easy for the kids to learn throwing low, medium and high punches. The bag is perfect for kids and youth that need to master the skills of balance and speed training. The unit has been made with natural rebounding properties with the external material being tough enough to handle all types of impact. Since it does not need any installation, you can assemble it anywhere you please and store it safely when not in use. Dreamhost Review - Are They Better Than GoDaddy?